Dolphin Star encompasses everything I do to be of service to my community through my talents, my abilities, my words, actions, and my imagination. 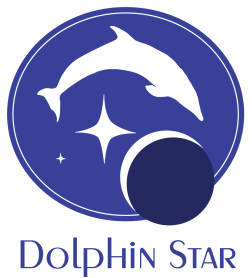 Registered as a business in the city of Bakersfield, California, it is my hopes that Dolphin Star can first and foremost be an outlet of imagination, inspiration, motivation, and productivity for all--spreading a message of action and service. Dolphin Star is so named for the traditional symbolism of the Dolphin--a legacy that has a deep impression on humans today. Sailors took the sight of dolphins as a good omen. The dolphin has been used as a traditional symbol in Christianity for the resurrection of Christ, as well as Baptism. The dolphin dives into the water, a form of passing through death, and leaping out of the ocean as a symbol of rising to new life. In modern day art and expression, the dolphin is used as a symbol of hope and serenity. It is also named for our perception and wonder of the cosmos--reaching for the stars, pondering on their mysteries, and yearning to delve into countless unexplored worlds. The longing to explore, to see something new, to see something change, to see light ahead, to dive into infinite realms of new frontiers is something I find key to communicating with my fellow humans. It is a common ground I simply love. Dolphin Star is wholesomely named to imply an outlet for not only hope (in a world where many people have little faith in themselves and all of humanity) but to imply victory over despair, and from that victory to leap into infinity, exponentially slip streaming into worlds of wonders and previously unimaginable possibilities. People can have hope--they forge it themselves, and not only for themselves but for others and for the world. As the owner of Dolphin Star, I strive to ensure I deliver with professional and courteous service. I seek to be more than a business owner, but an advocate of inspiration, hope, and encouragement - the very principles from which Dolphin Star is founded upon, and on which I hope to keep it aloft as a light and a motivation for people and communities.